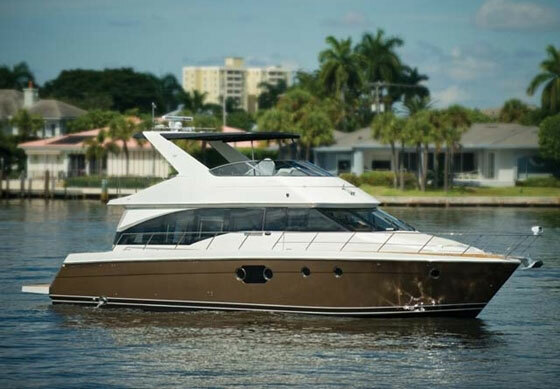 Carver Yachts continues its push for new models, new innovation, and affordable pricing, with the C40. 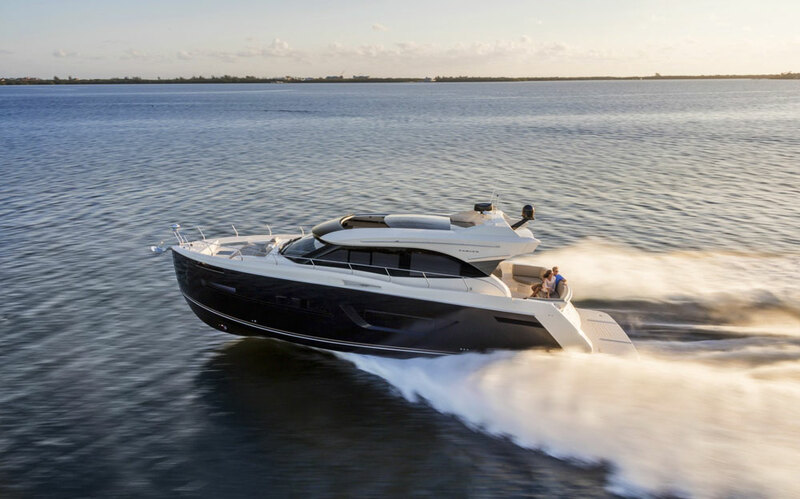 After rolling out a pair of hot new boats recently, the Carver C34 and the 54 Voyager, there seems to be a good argument for Carver Yachts to throttle back for a moment and slip into a party state of mind. The Wisconsin-based builder celebrates its 60th anniversary this year, and it does so in what seems to be a happy place as the company’s new models are being well-received by consumers with a penchant for coastal cruising. 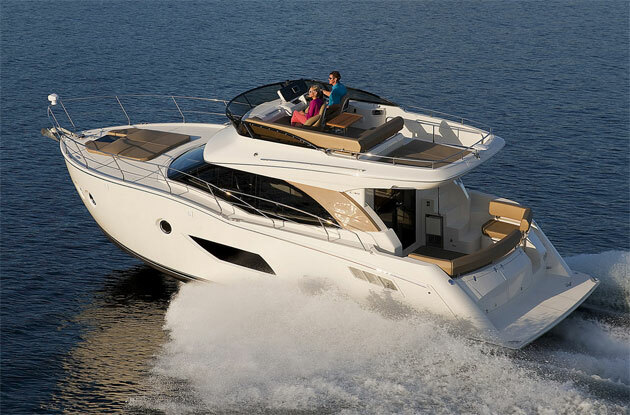 Also worth celebrating is the fact that these models represent an evolution for the company that’s perhaps best known as the production builder that popularized the aft cabin motor yacht in the 1980s. The new Carvers have a fresh, modern look, with straight sheerlines that are a bit reminiscent of expedition yachts, and also indicative of the direction the builder is headed. 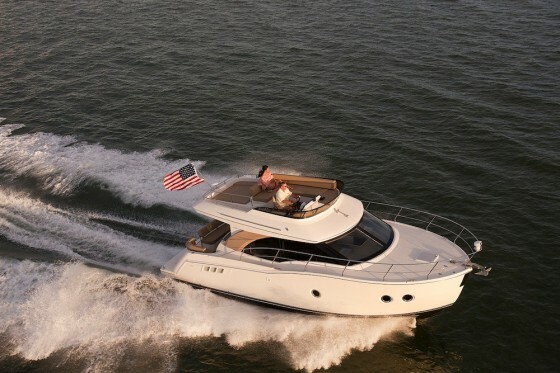 At the same time, the boats possess that core Carver DNA, which is to say they’re engineered to be dependable, designed to be the among the most spacious boats in their class, and are priced very aggressively. The C40 is a command bridge boat, a style that appears to be finding more fans as owners of express cruisers search out models with more usable space in the same basic footprint. The newest Carver on the water, the C40—which we had the chance to inspect at the Ft. Lauderdale Boat Show, where we shot a C40 First Look Video—offers up room for a family or two couples to overnight and move about the boat very comfortably while enjoying a degree of privacy, all in a boat that actually fits into a 40-foot slip. (The LOA is 39’10, even with the pulpit and swim platform.) The market for bridge boats in this size range is a bit under-served by American builders, but Carver has always been a player here and will continue to flex its muscle with this new 40. One reason the C40 is a good choice for those moving out of express cruisers: propulsion. The Carver gives an owner the opportunity to graduate from sterndrives to a pair of Cummins 6.7L diesels, here coupled to V-drives. Docking should be straightforward, but if you want even less stress, the C40 is offered with bow and stern thrusters that can be rigged to an optional Xenta joystick control. Teleflex SeaStar hydraulic steering is standard, as are Bennett trim tabs. The boat is operated from the helm station on the bridge, but an optional driving station in the cabin is offered, too. That’s a good choice for those who want to extend the cruising season, or simply want the luxury of a climate-controlled environment when clocking time at the wheel. The C40 also has a broad beam (13’6”), which typically translates into stability. There’s also that full plumb bow with straight stem—the stem alone functions to give the boat a longer waterline length than some competitors of similar size, allowing the boat to better bridge waves and reduce pitch. All of that freeboard forward should make for a dry ride, too. Standard power is a pair of 305-hp Cummins, with a pair of 380-hp power plants offered as options. Speed and fuel numbers are not yet available, but efficiency should be respectable thanks to the diesel engines and the fact that the boat is infused during construction to keep weight low and strength high. About that high forward freeboard: It does more than enhance the ride. It also creates more interior room to work with. 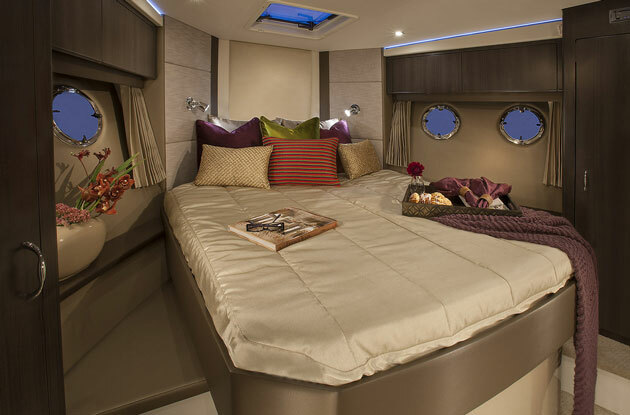 On the C40, the space is devoted to the master stateroom at the bow, where there’s an island berth, hanging lockers, and private access to the en suite head with its walk-in shower stall. Round portholes, which look as distinctive from the inside as they do from the dock, dog down tight for rough-weather motoring. In this stateroom, it’s possible for the owner to escape the crew for a short time—and that’s something that’s not always easy to do on a boat under 40 feet. 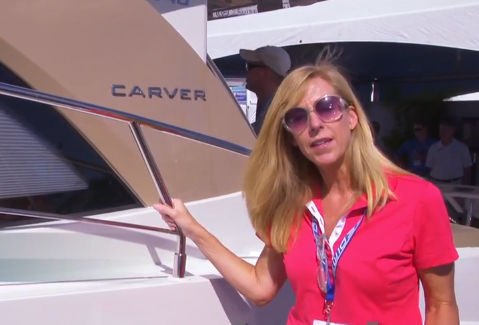 An unusual feature in the Carver C40 master is headroom that’s well over six feet. The master stateroom is one of two private cabins on board. The guest suite also has a door and bulkhead, plus two single berths that can be converted to a queen with filler cushions. The guest head serves double duty as a day head. It’s a few steps up from the accommodations level to the open saloon. 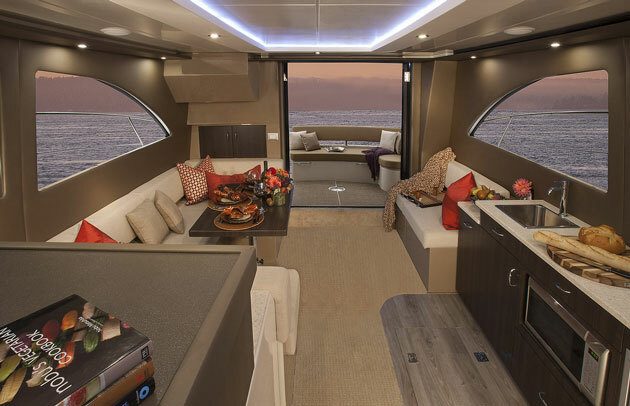 In the forward corner is a galley that’s equipped with all major appliances, many of them home-style, plus a chilled wine locker in a stowage compartment under the sole. There’s also plenty of counter space, although the area is light on fiddles and rails. The galley serves the big saloon, which is made to look modern with its straight edges, minimalist chic décor, artful mix of faux wood and neutral fabrics, and just the right amount of glossy fiberglass. It’s quite nice, really, both neat and handsome and well-lit thanks to big windows all around. We also like the indirect lighting in the overhead soffit, which is a yacht-style touch. 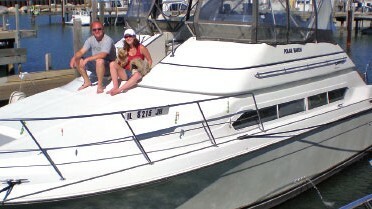 Seating includes a loveseat to port and dinette to starboard, which can double as a berth for two guests. The salon is adjacent to double-wide sliding glass doors that open into the cockpit. There’s a step between the two areas, so moving back and forth isn't quite seamless, but when those big doors are flung open wide and hinged into place, the C40 appears to offer one huge entertaining space that’s just as nice for a large group as it is for an intimate gathering. The saloon takes full advantage of huge aft glass doors, which swing open to bring in sunshine and salt breezes. This stairway is just one way Carver makes it simple for crew to get around on the 40. There are also broad sidedecks (13” at the widest point) flanked by high side rails and grab handles along the bridge, which make it easy to go forward to handle lines. 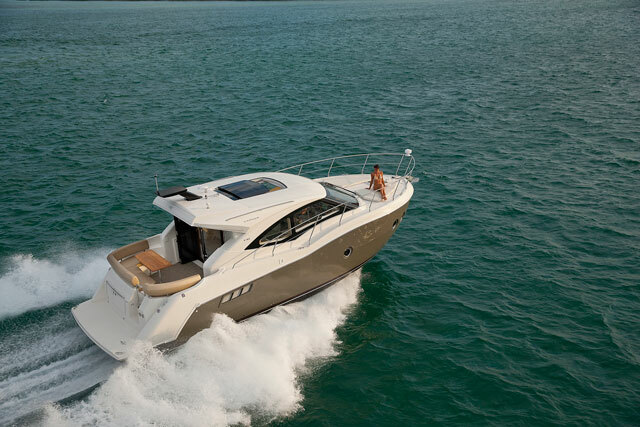 As for price, the new C40 retails for about $458,575 with standard power, which is competitive when you add up all of the standard equipment that comes with the base boat, not to mention all of the usable space and those efficient diesel engines. So it seems there may be good reason for an owner, too, to throttle back and slip into a party state of mind. 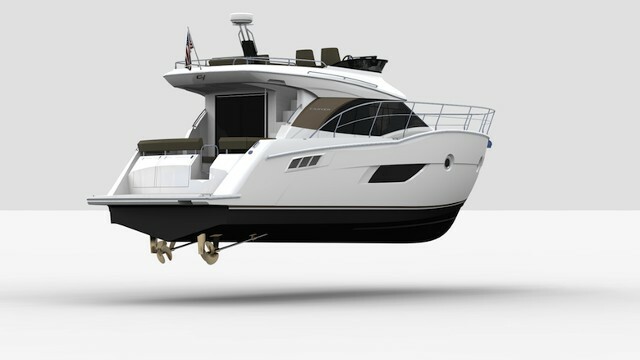 Other Choices: A slightly larger option is the Rodman 42 Flybridge, which runs on pod drives instead of V-drives. The Bavaria Virtess 420 is a German-built competitor, which places its emphasis on a huge flybridge with numerous amenities.